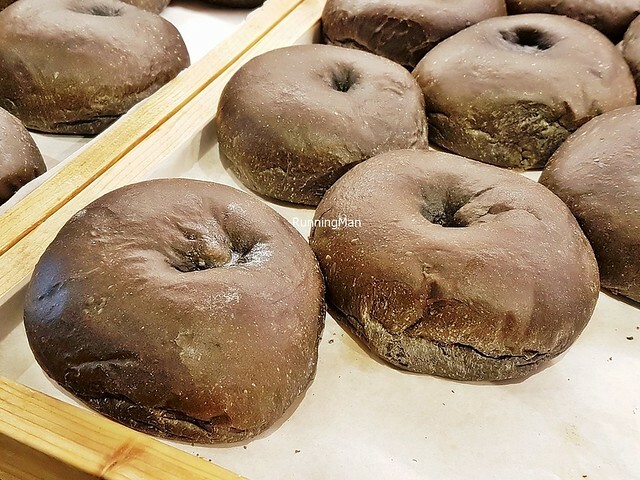 Food in Jeju & Seogwipo can be found along the streets in pushcarts or small cafes, in mid-range restaurants, and fine-dining establishments. 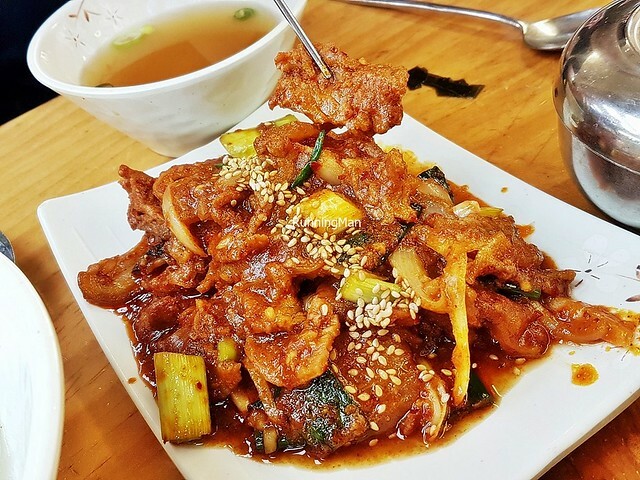 Korean cuisine is largely based on rice and legumes, with dishes being heavy on seasoning, and usually include fermented items. As a result, many dishes taste tangy, salty, sour, or spicy. 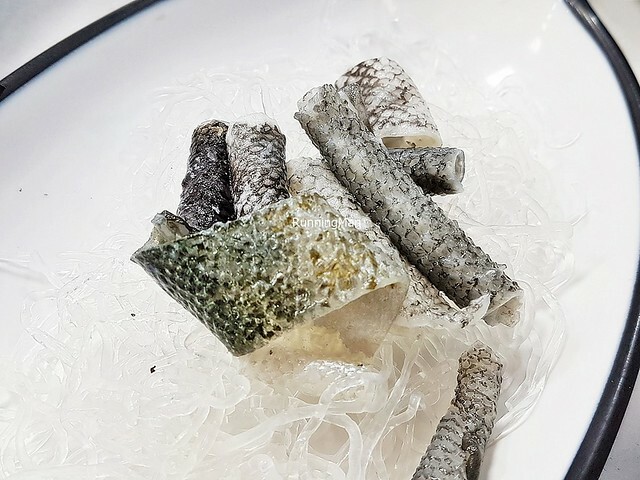 Common ingredients used in many Jeju & Seogwipo and South Korea dishes include white rice, soybeans, tofu / beancurd, Tteok / Dduk / rice cakes, sesame oil, doenjang / fermented soybean paste, soy sauce, salt, garlic, ginger, gochujang / fermented red chili paste, cabbage, barley, buckwheat, mung beans, adzuki red beans, vinegar, onions, pork, mackerel fish, hairtail fish, Pacific herring fish, anchovies, shrimp / prawns, octopus, cuttlefish, squid, abalone, cucumber, potato, sweet potato, spinach, bean sprouts, seaweed, zucchini, mushrooms, tangerines, chili and more. 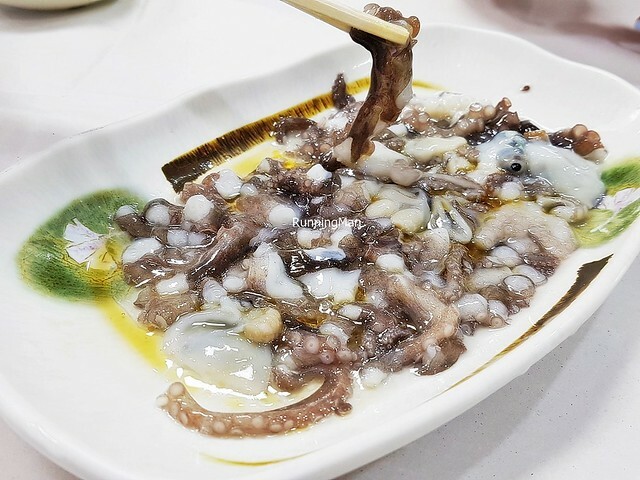 The Jeju Special Administrative Province in South Korea is reowned for 2 specialities; black pork and fresh seafood. 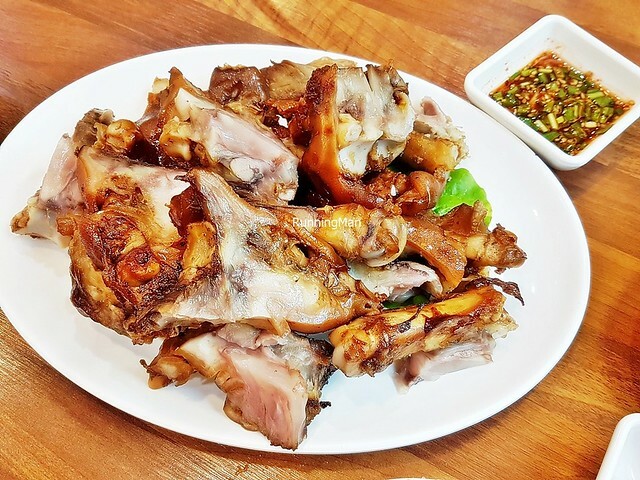 These feature heavily on menus here, to the extent that other options such as chicken or beef are limited, and the quality usually isn't as good. 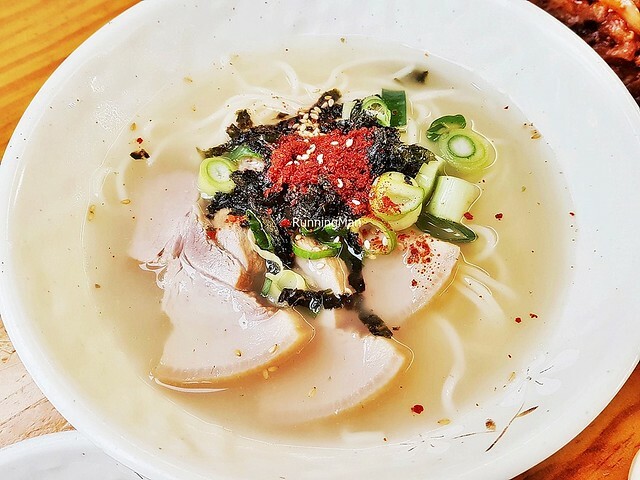 Meals in Jeju & Seogwipo follow the same Korean etiquette, with the eldest normally being served first, dishes laid out on the table in a specific order, and meals eaten in silence. 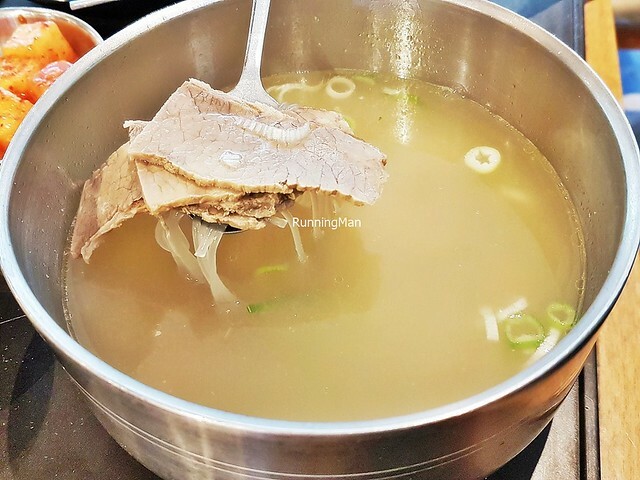 The Seolleongtang / Beef Bone Soup is a hearty soup / broth, made by boiling beef leg bones, creating a stock which is translucent in appearance, with a rich, savoury flavour. A staple in most households, it's garnished with beef brisket / beef short ribs, rice noodles / white rice, salt, pepper, and chopped spring onions. Simple comfort dish. 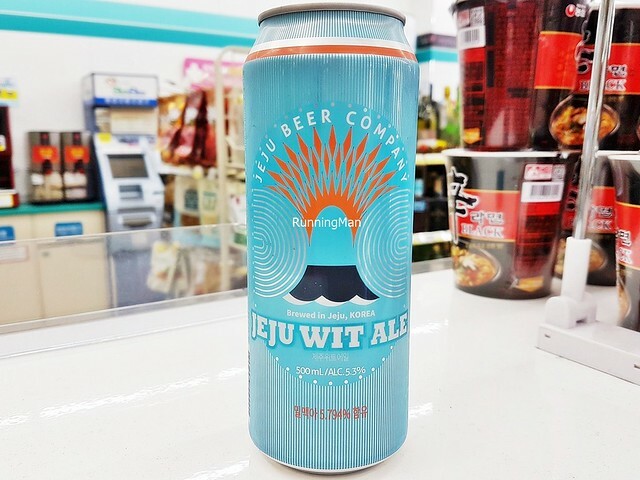 The Beer Jeju Wit Ale is a Belgian style Witbier, brewed in Hallim-Eup, Jeju & Seogwipo, Jeju Special Administrative Province, South Korea, using natural spring water and local tangerines. It has a cloudy, pale golden colour, with aromas of orange, wheat, hops, and coriander. Body is light, thin, and smooth, with tastes of tangerine, bread, clove, and lemon. The zesty fruity sweetness is refreshing and thirst-quenching, perfectly matching the climate of the island. 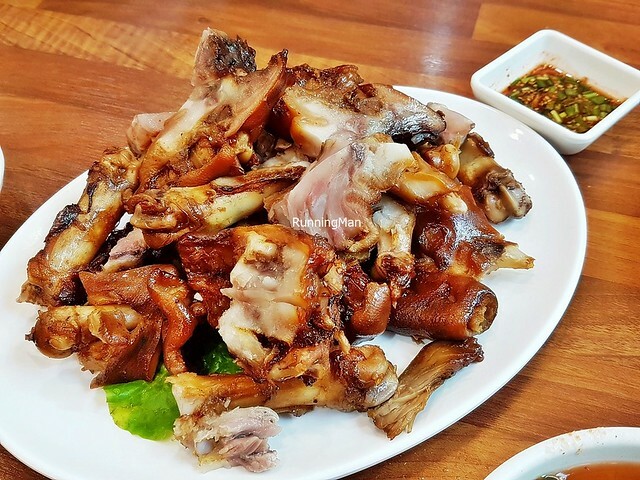 The Boiled Pork Hocks is a traditional dish, owing to the premium quality of the local pigs. The pig's trotters are slow boiled with water, light soy sauce, ginger, garlic, and rice wine. Sometimes, spring onions, cinnamon, or leeks are added. The resulting texture is bouncy and gelatinous, with a robust savoury flavour. Served in large communal portions, it's actually eaten to accompany a meal, or as a bar snack. 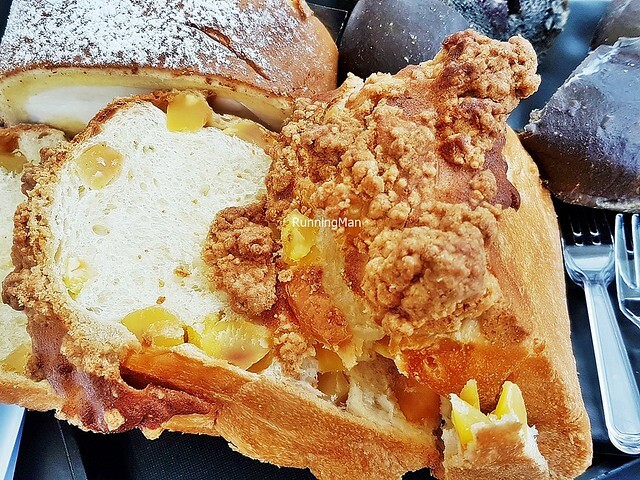 The Chestnut Bread is a modern confectionery, featuring fluffy soft brioche bread studded with crunchy chestnuts. The flavour is delicate sweet nutty. Crafted and baked by local cafes here. 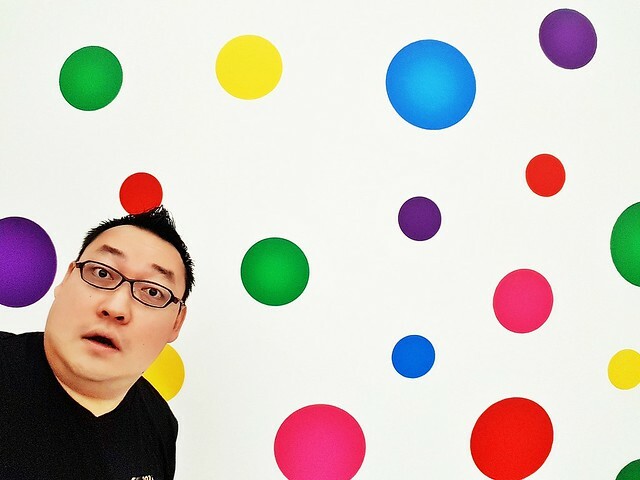 This Korean beverage is not a cider per se. 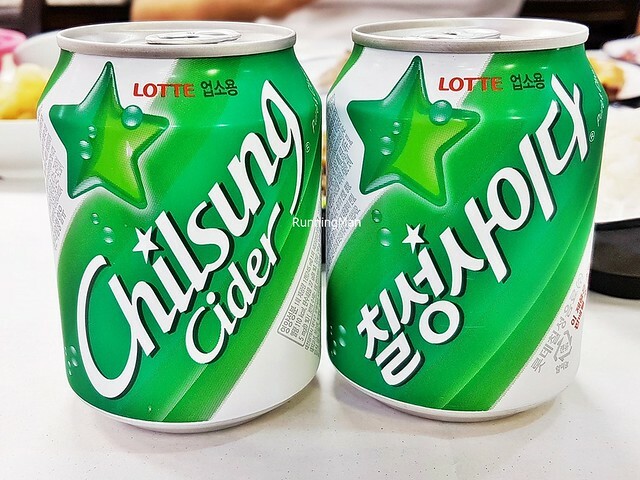 Rather, Chilsung Cider is a carbonated soft drink, clear and fizzy, similar to a lemon lime soda. Refreshing when chilled, it has a sticky sweet flavour. 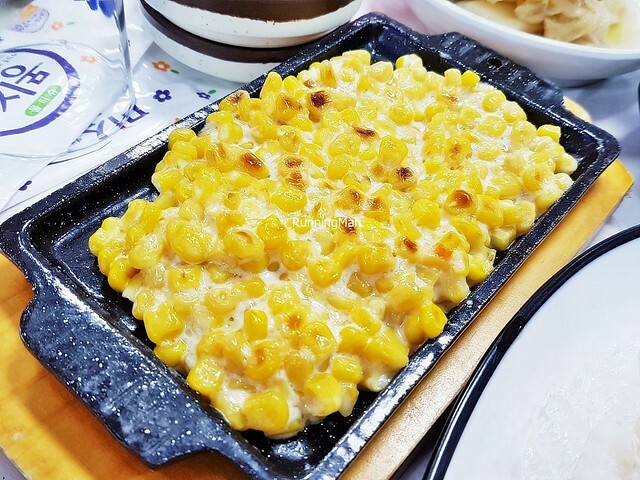 A popular side dish here, the Cream Corn features corn kernels tossed in a light butter and mayonnaise, served on a hot plate to keep it warm. Other variations on this add mozzarella cheese, making it more filling. 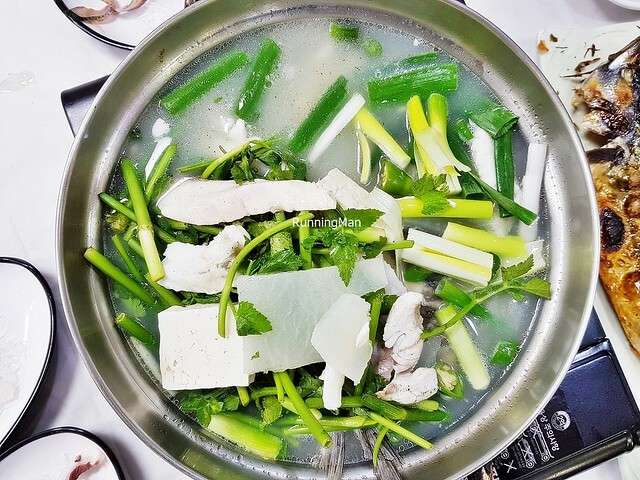 Considered an iconic dish of Jeju & Seogwipo, the Cutlassfish / Largehead Hairtail Soup features the island's signature fish - the long, slender, silver skinned cutlassfish / largehead hairtail fish, which has tender flaky fish meat and a delicate sweet savoury flavour. 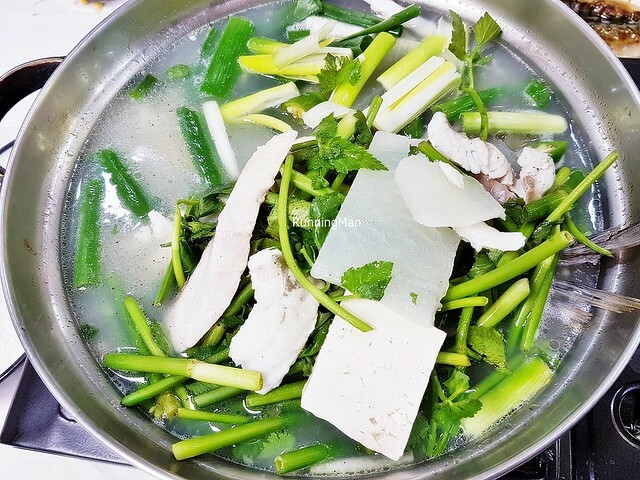 This traditional dish features the fish, simply boiled in water, along with salt, cabbage, kabocha squash, Asian leeks, tofu beancurd, and spring onions. 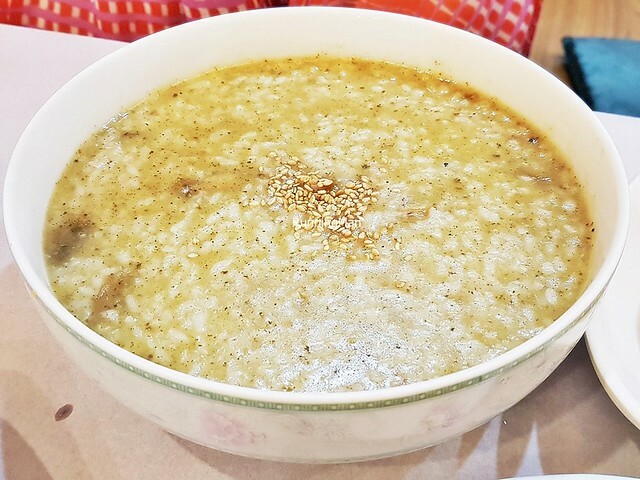 The warm soup / broth is light on the palate, and typically served to round-off a meal. 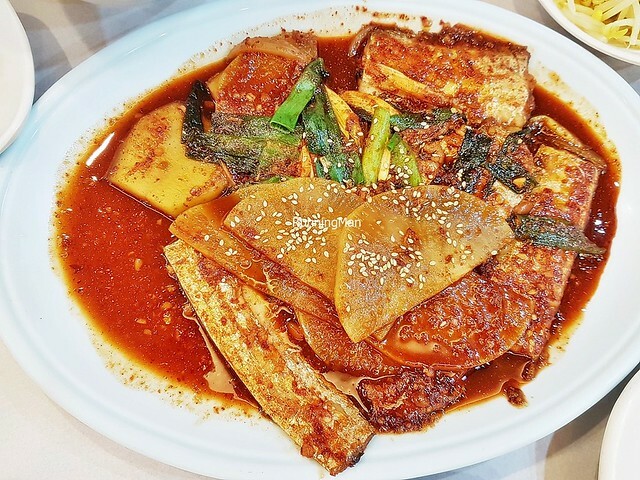 The Galchi Jorim / Braised Cutlassfish - Largehead Hairtail Spicy Stew is the spicy stew version of the island's signature dish. 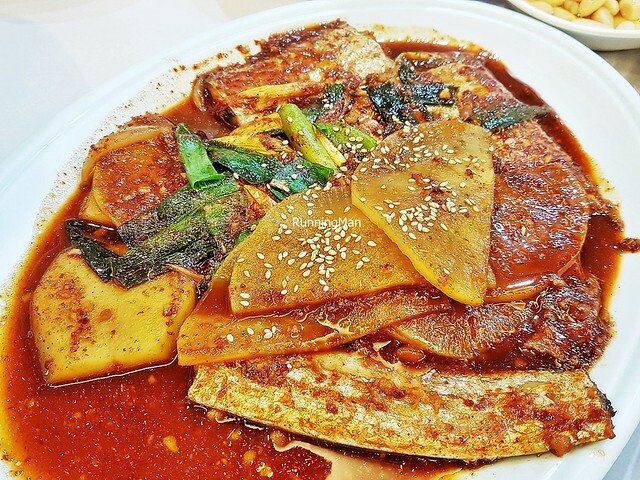 It features the cutlassfish / largehead hairtail fish, with its tender flaky texture and delicate sweet savoury flavour, stewed together with water, salt, kabocha squash, daikon radish, gochujang / fermented red chili paste, and spring onions. This dish has a strong fishy taste, and a robust sweet savoury spicy flavour, which the locals seem to like. 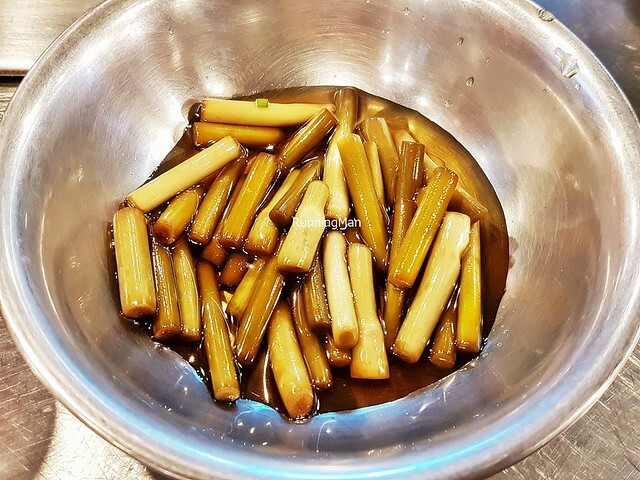 Served as a side dish, the Daepa / Asian Leeks features crunchy Asian leeks tossed in a light soy sauce, giving it a bright yet salty flavour. Served to accompany dishes whose flavours are light and clean, providing a nice foil in taste. 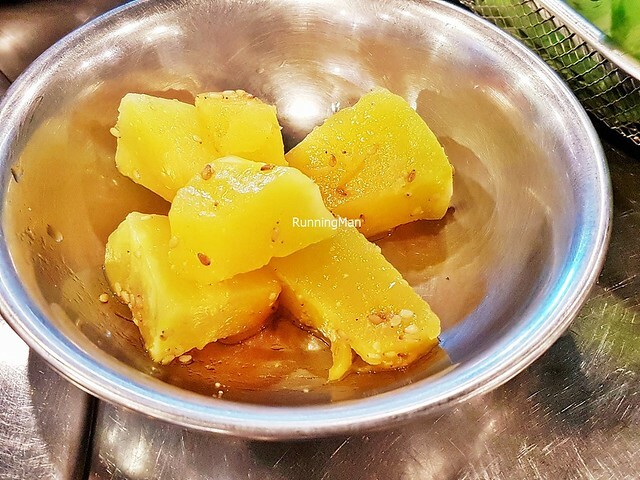 Served as a side dish, the Danhobak / Kabocha Squash features cubes of tender, sweet earthy kabocha squash. 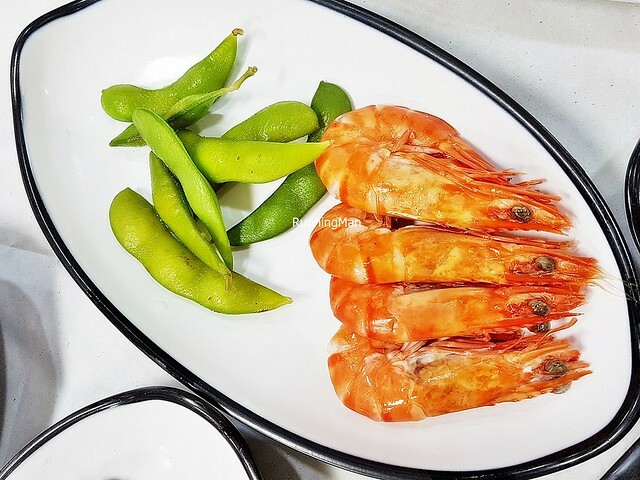 The delicate flavour serves to provide a balance to heavier flavoured dishes such as grilled seafood or grilled meats. 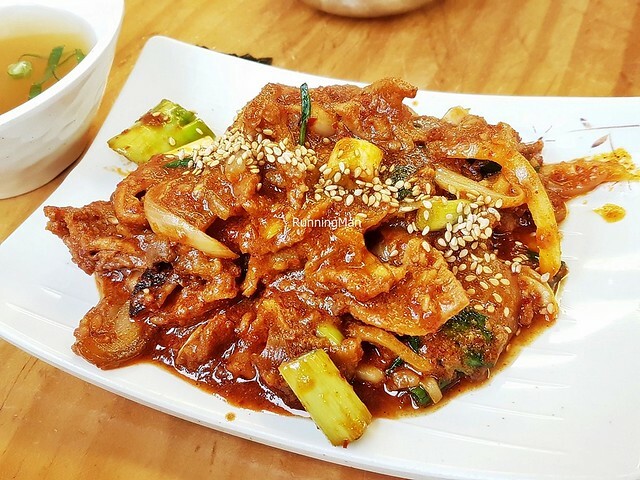 The Dweji Bulgogi / Pork Bulgogi features sliced pork loin, marinated in a sauce made from white onions, garlic, ginger, green onions, light soy sauce, sugar, black pepper, gochujang / fermented red chili paste, and sesame oil. The stir-fry results in tender pork loin, with a sweet savoury spicy flavour. Usually wrapped in lettuce before being eaten. 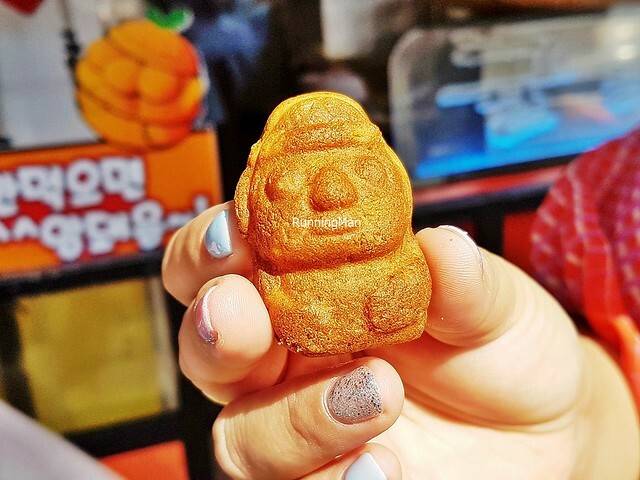 The Eomuk / Fish Cake is a processed snack made from mashed white fish (cod, pollock, flounder, snapper), sugar, salt, onions, all-purpose flour, sweet potato / potato starch, water, and eggs. 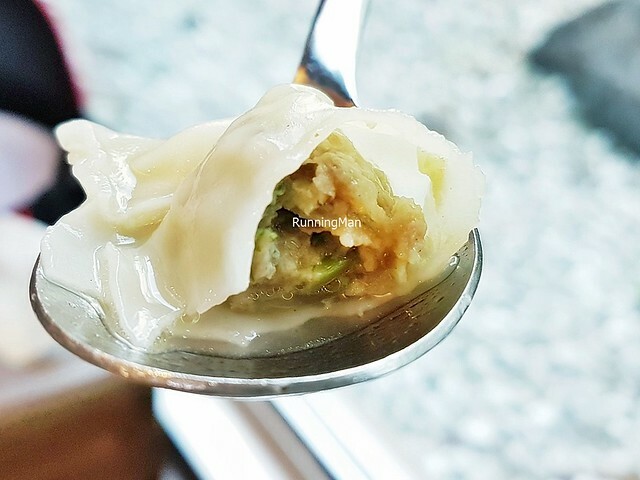 It has a bouncy soft texture, with a light savoury sweet flavour. Usually added as an ingredient to other dishes. 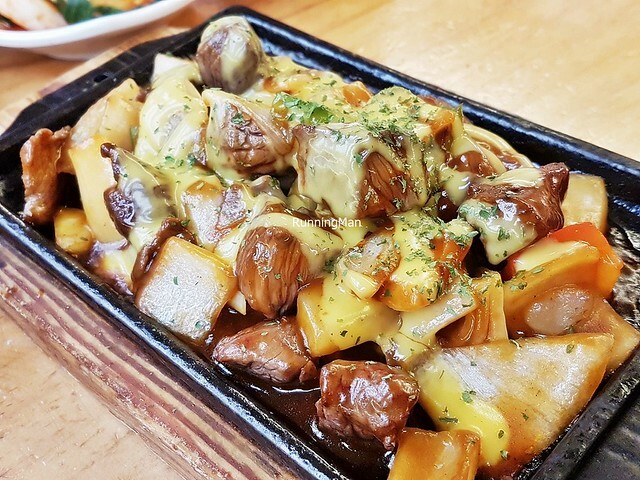 The Gogigui / Barbecue is not a dish, but rather a dining experience. Diners gather around a charcoal grill built into a table, with a ventilation shaft directly overhead, to roast various types of meat. 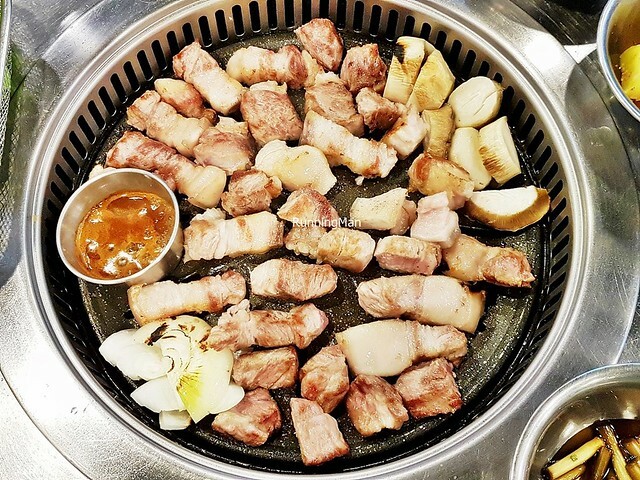 A typical Gogigui / Barbecue is accompanied by Banchan / side dishes, and a dipping sauce of Ganjang Yangpa Gochu / Soy Sauce With Onions & Chili. 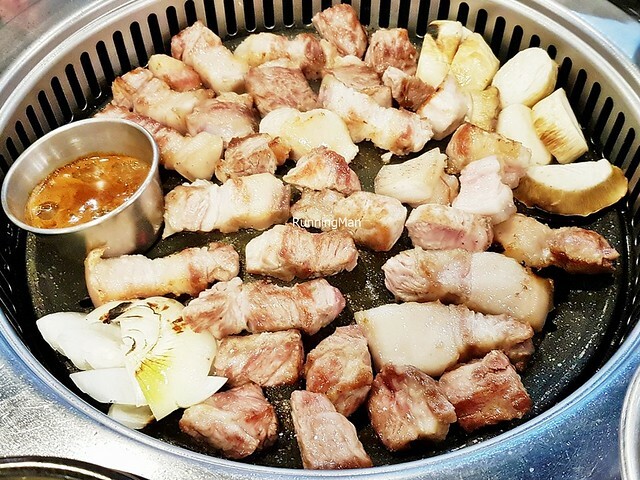 In Jeju & Seogwipo, the most common and popular meat is black pork. 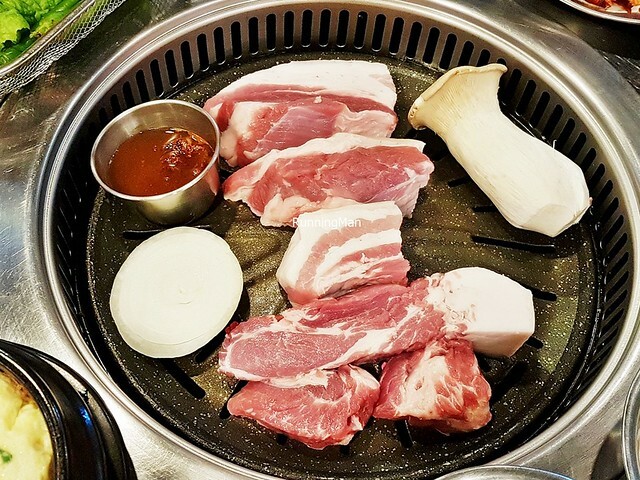 Various cuts are available, such as Teog / Pork Jowl, Samgyeopsal / Pork Belly, and more. 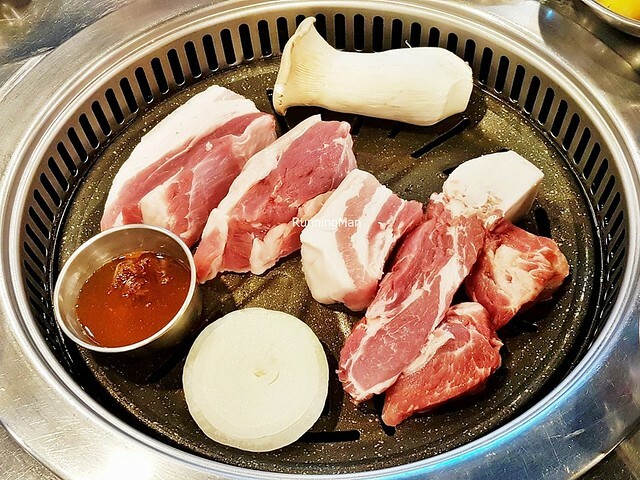 All these meats are usually eaten together with Sangchu / Lettuce, where the meat is wrapped within along with gochujang / fermented red chili paste. 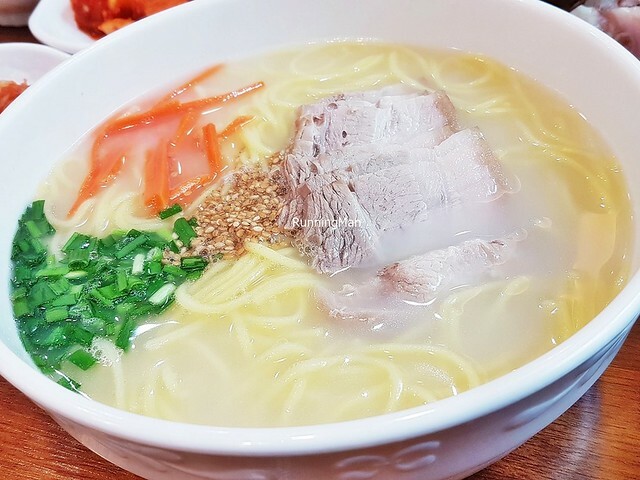 A traditional dish common to Jeju Special Administrative Province of South Korea, the Gogi-Guksu / Pork Noodles originated due to poor soil conditions for growing white rice. As a result, locals had to adapt to wheat noodles. A culture of giving black pork during happy occasions, coupled with their staple, resulted in this dish. 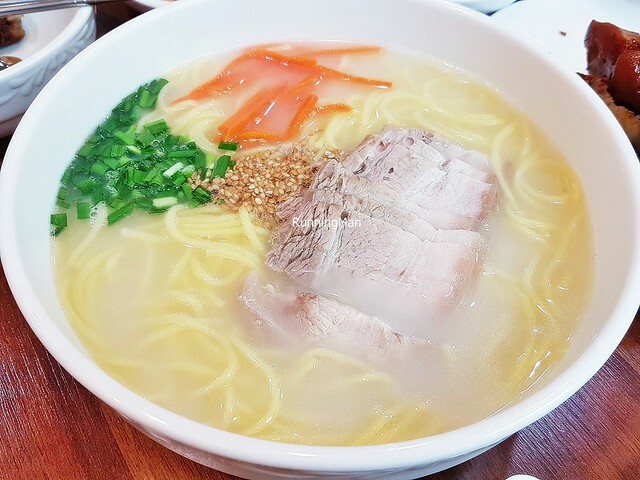 It features long, thin wheat noodles with a soft bouncy texture, garnished with thick slices of tender savoury black pork, which is less gamey than regular pork, with a tinge of sweet nutty flavour. 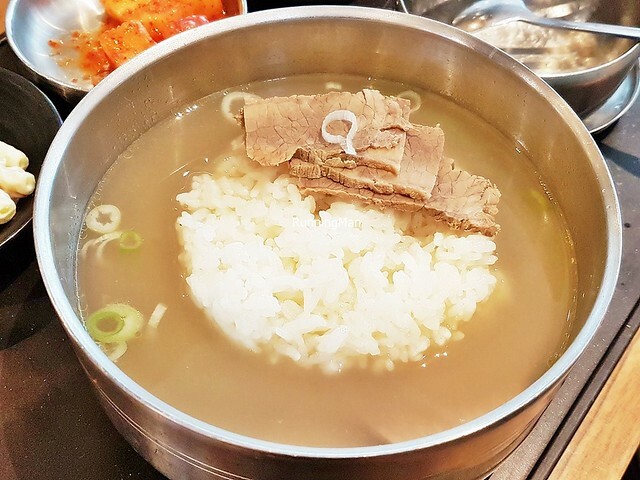 The hearty, semi-translucent milky soup / broth is made by boiling black pork bones for 12 hours, resulting in a rich, delicious bowl of food. Sometimes garnished with carrots, seaweed, spring onions, or chili. 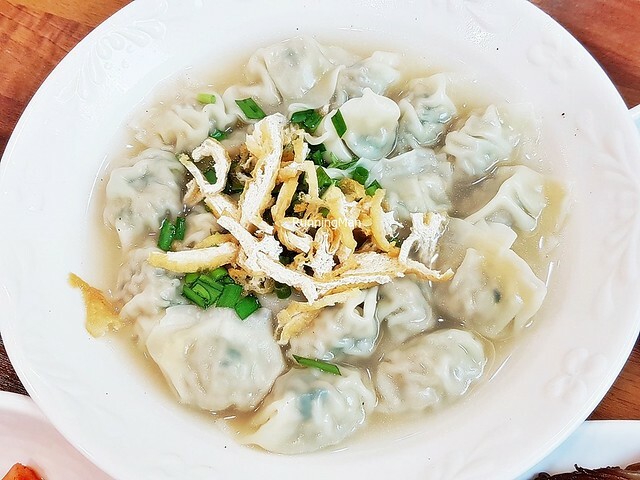 An iconic, must-eat dish when visiting the island. 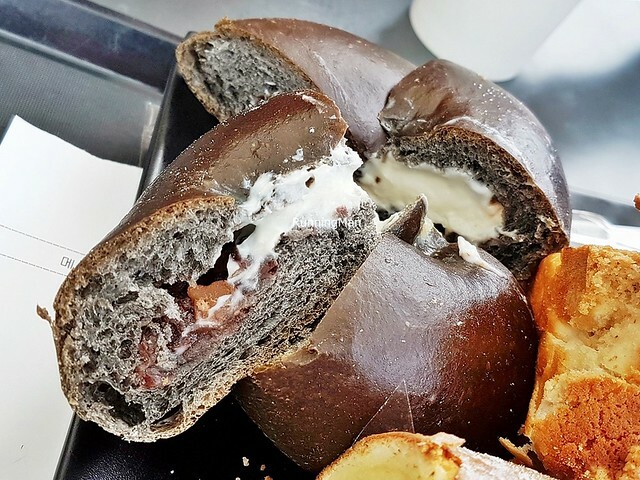 It may be called Gravel Bread, but it's delicious. This charcoal-infused bun is soft and fluffy, tearing apart easily. Within, a sticky filling of earthy sweet red bean paste and light airy cream, nicely balanced on the palate. 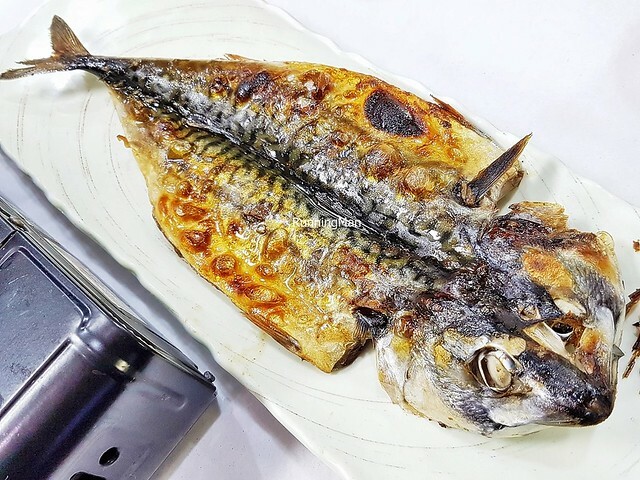 The Grilled Mackerel in these parts is marginally better than elsewhere, due to its freshness. And because it's readily available, it's also usually cheaper. 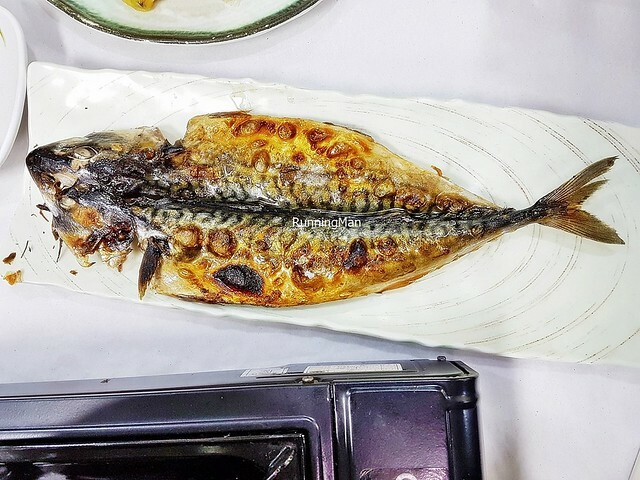 A whole mackerel fish, grilled till it takes on a golden brown colour and a smoky aroma. 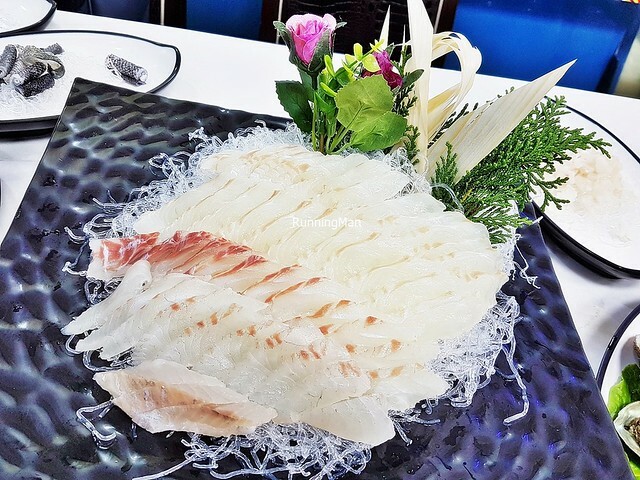 Nice flaky texture to the fish meat, which comes off the edible bones easily, and has a savoury salty flavour. 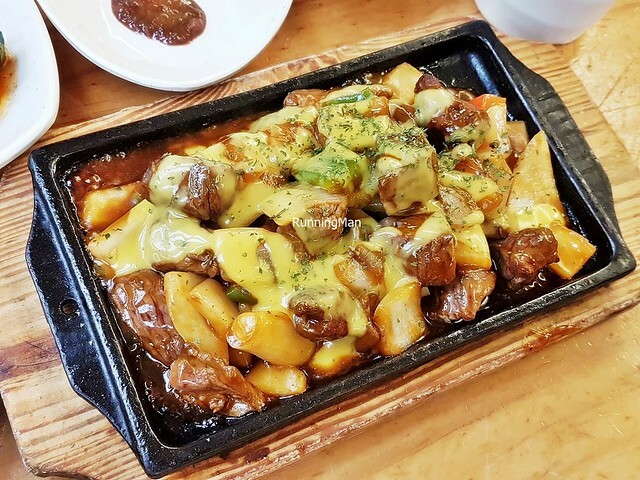 Among the more exotic dishes on the island is Horse Meat Hot Plate. 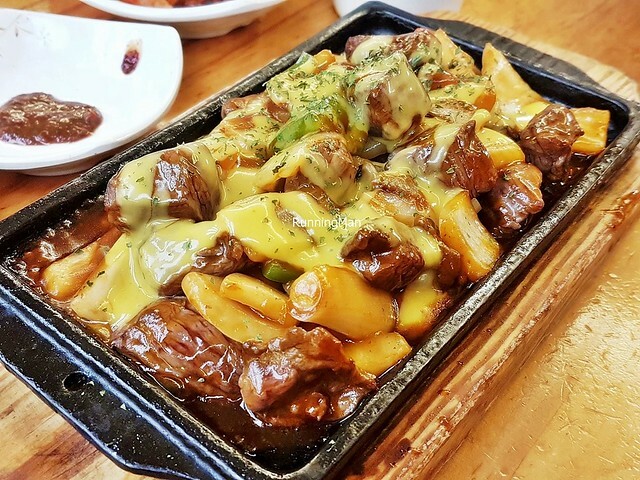 Cubes of farmed horse meat, with a tender chewy texture similar to beef, is grilled to a medium doneness. 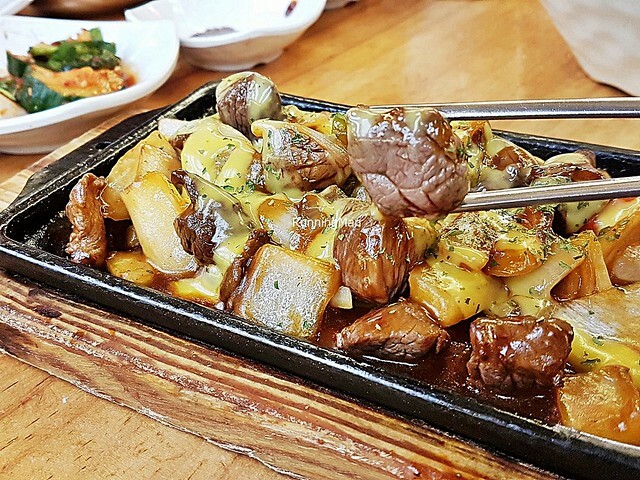 Seasoned with salt and yellow mustard, it has a delicate savoury salty flavour, less gamey than beef. The tangy sauce helps to balance the meaty taste on the palate. 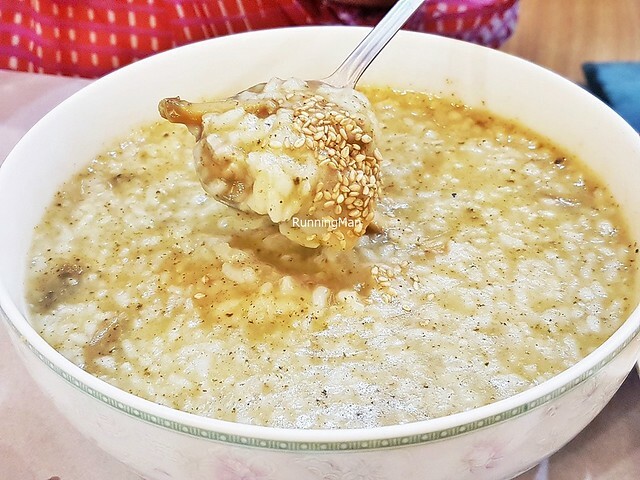 The Jeonbok Juk / Abalone Porridge is popular amongst tourists, because the luxury ingredient of abalone is more abundant and affordable here. 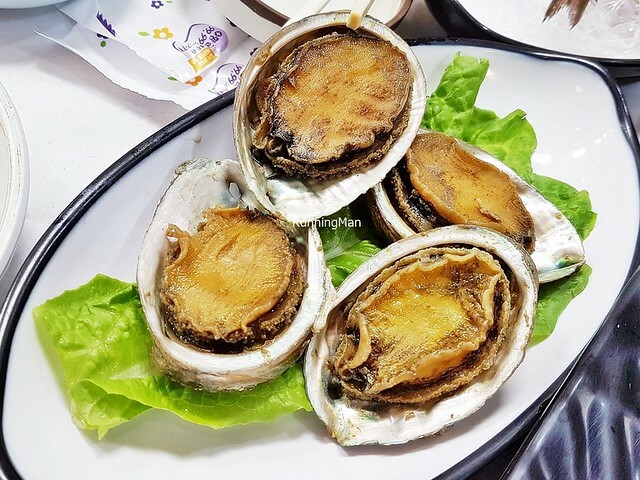 The abalone is slow boiled with white rice, water, and light soy sauce, with the finished dish garnished with seaweed and sesame seeds. It has a semi-thick, sticky texture, with a delicate sweet savoury flavour. I personally like to add condiments for better taste. 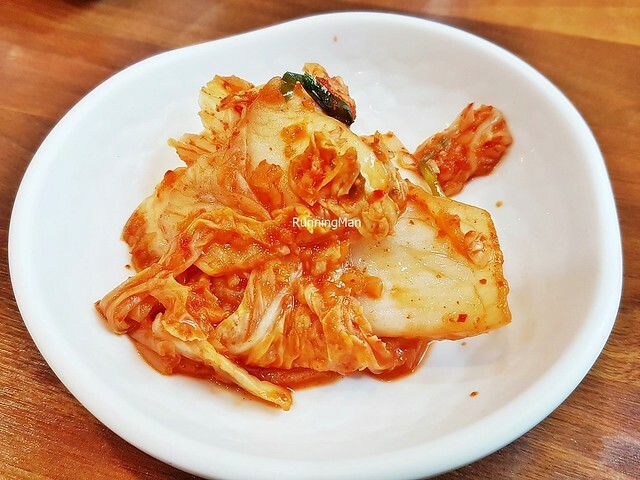 Considered among the world's healthiest foods, and said to even prevent stomach cancer, Kimchi Baechu / Kimchi Pickled Cabbage is more than just a tasty Banchan / side dish, but is also a versatile ingredient incorporated into many Korean dishes. 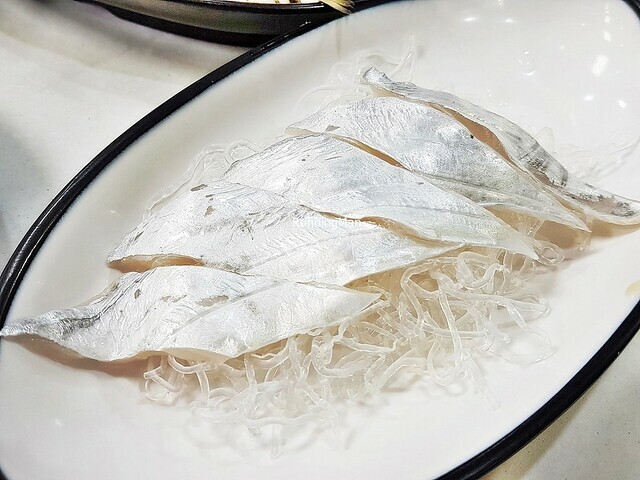 It's made with napa cabbage rubbed with sea salt; seasoned with a paste made from scallions, ginger, daikon radish, garlic, glutinous rice, saeujeot / fermented shrimp sauce, aekjeot / fish sauce, eoriguljeot / oyster sauce, and chili; then left to ferment in a brine of vinegar and water. 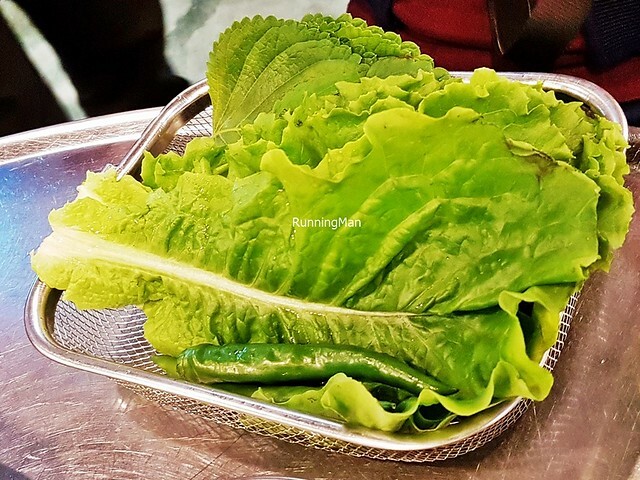 The most iconic national dish of South Korea, this is commonly served at every meal in Jeju & Seogwipo, and has a sour, sharp taste, with a crunchy texture. 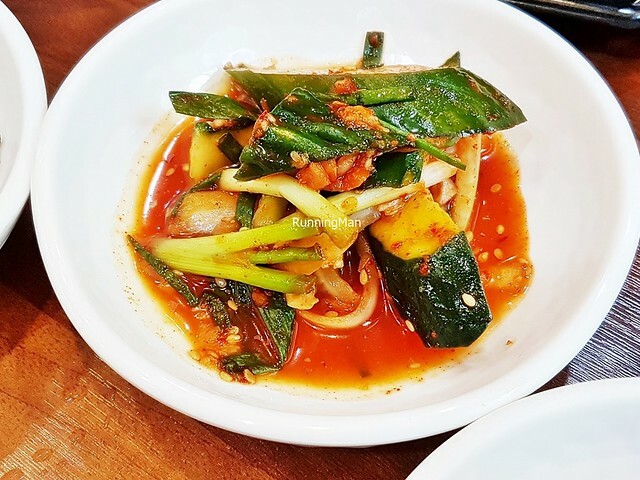 Trailing just behind in popularity is another variation of Kimchi, the Kimchi Oi Sobaegi / Kimchi Pickled Cucumber, also served as a Banchan / side dish. While essentially all the same seasonings, ingredients, and preparation methods are used, this simply replaces the napa cabbage with cucumbers instead. It has that same sour, sharp taste, with a crunchy texture. 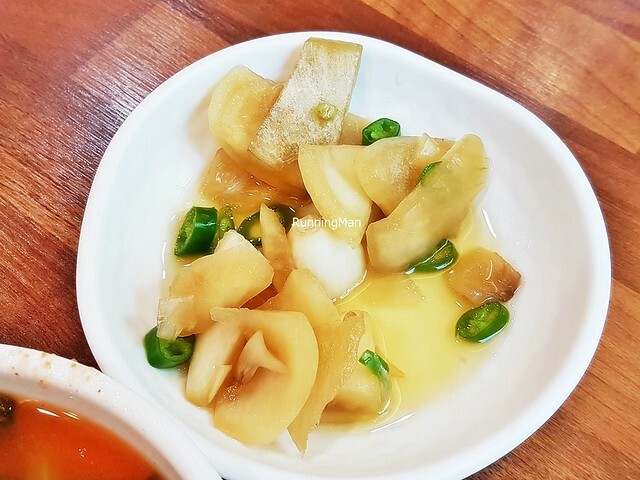 The Kimchi Kkakdugi / Kimchi Cubed Pickled Daikon Radish is a Banchan / side dish that is usually consumed chilled, and has a sour, sharp taste with a crunchy texture. 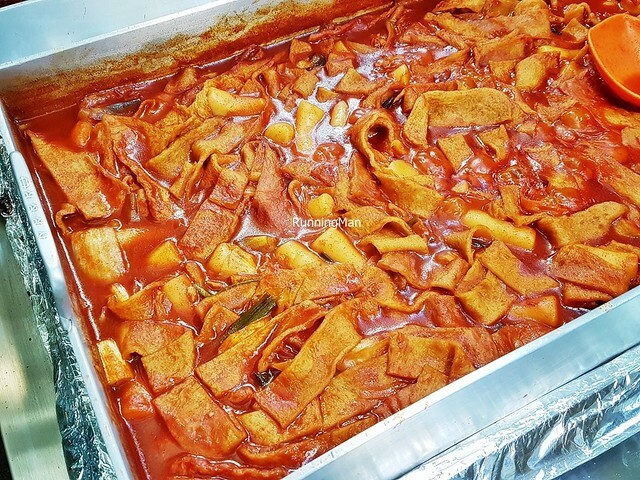 It uses the same seasonings as other Kimchi items. 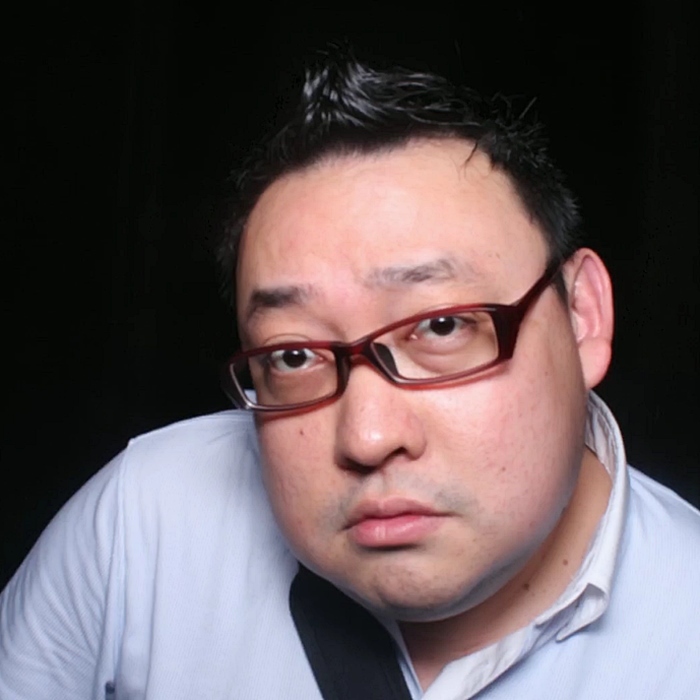 Timing is more critical with the daikon radish, as it has to be eaten before it goes soft. 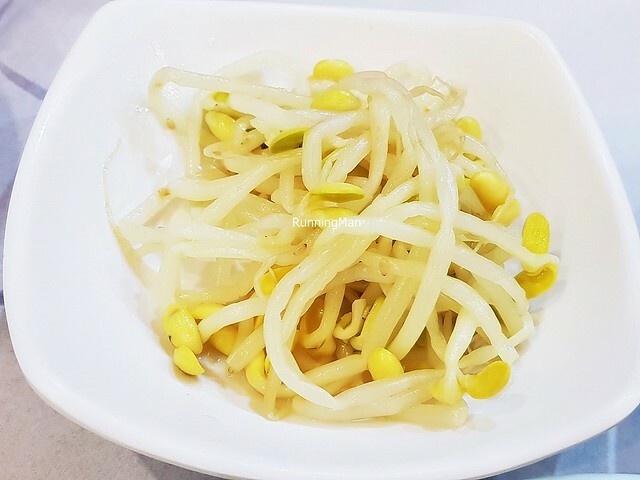 Another common Banchan / side dish, the Kongnamul / Cold Soy Bean Sprouts is a chilled sweet savoury dish, featuring soybean sprouts boiled with salt, garlic, aekjeot / fish sauce, then garnished with sesame seeds. Sometimes, chili is added. This is eaten along with white rice. 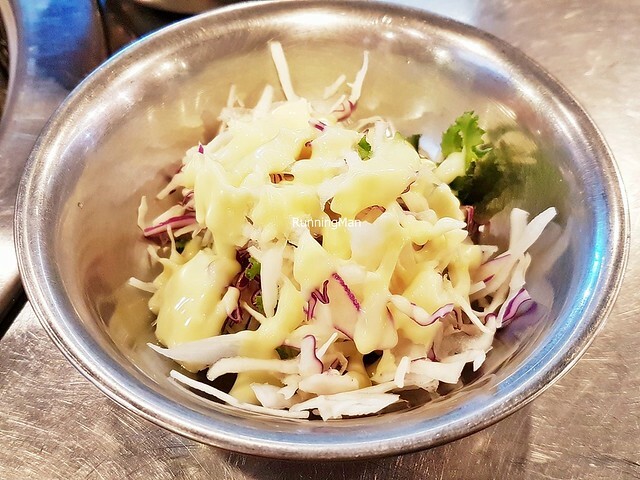 The Korean Coleslaw features a mix of purple and white cabbage, shredded and coated with mayonnaise. Has a nice freshness, with a crunchy texture, and a light vegetal sweet flavour. 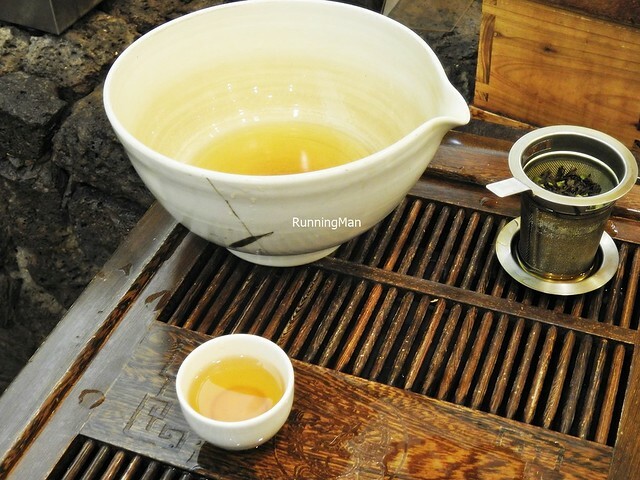 As the oldest liquor in the country, Makgeolli / Rice Wine, also known as Nongju, is a drink favoured by the working-person. Made from nothing more than fermented white rice, yeast, and water, this milky, semi-sweet, slightly fizzy alcoholic beverage is surprisingly healthy, with up to 10% composed of lactic acid bacteria and dietary fiber. 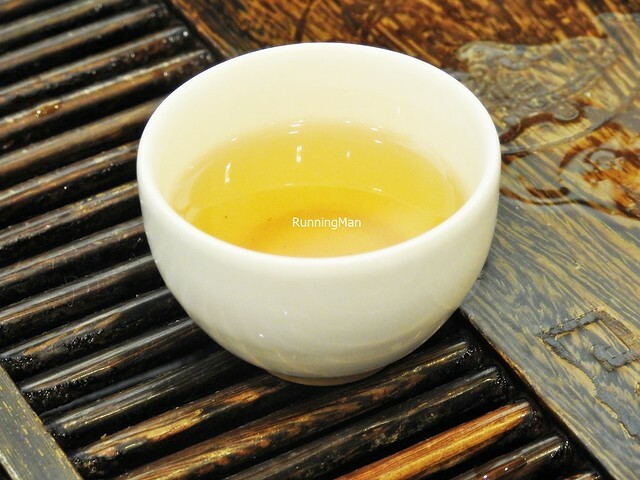 This unfiltered rice wine has an almost universal appeal, from both genders, youth to elderly, and even celebrities. 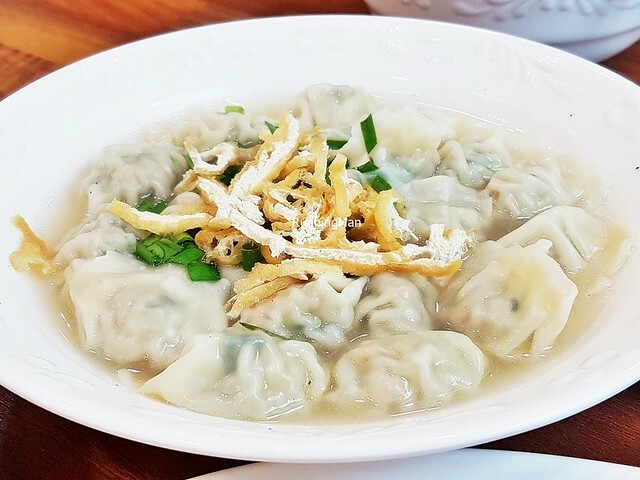 The Mandu / Dumpling is a common main dish / snack, and are usually filled with either minced meat (pork, beef), tofu / beancurd, spinach, mushrooms, Kimchi Baechu / Kimchi Pickled Cabbage, scallions, or a combination of these ingredients. 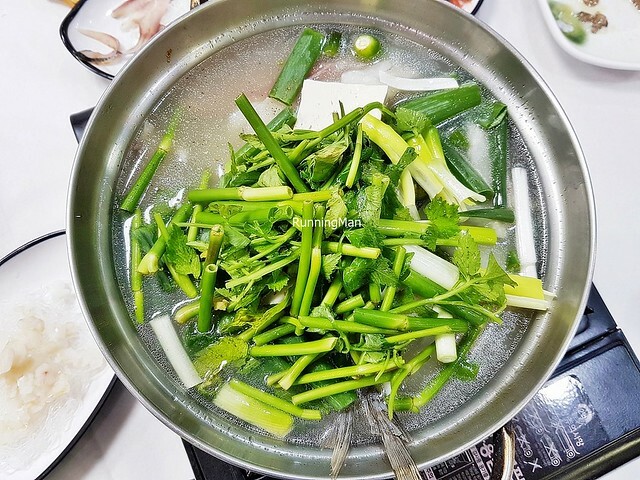 It can be boiled or steamed, grilled or fried, served dry or in a soup / broth. 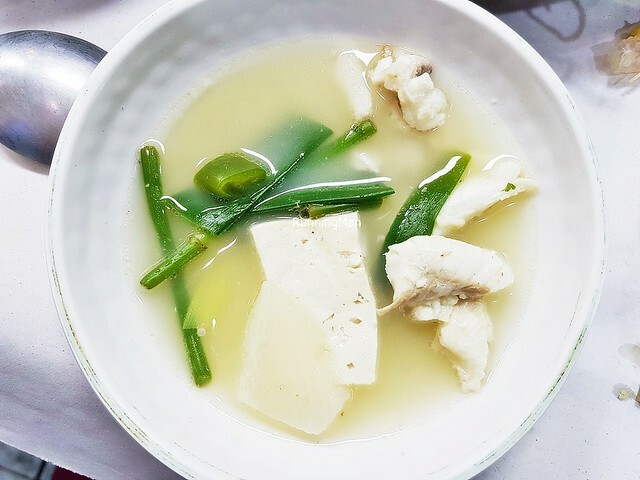 If served in a soup / broth, the dish is called Manduguk, and usually features either a beef stock or anchovy stock, along with egg and seaweed. 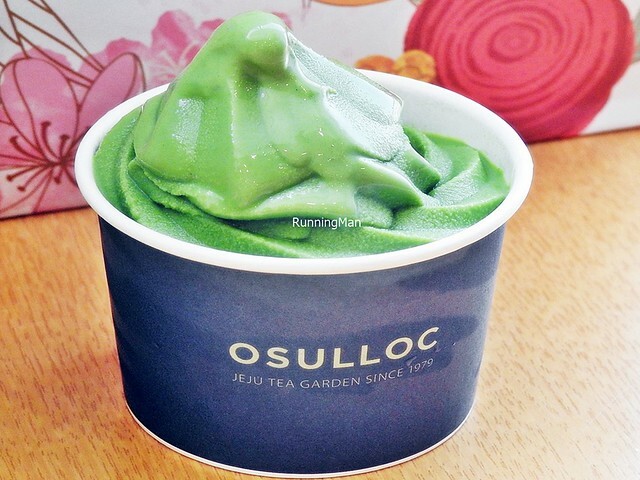 The Matcha / Green Tea Ice Cream contains premium green tea powder and milk, sourced from local farms. 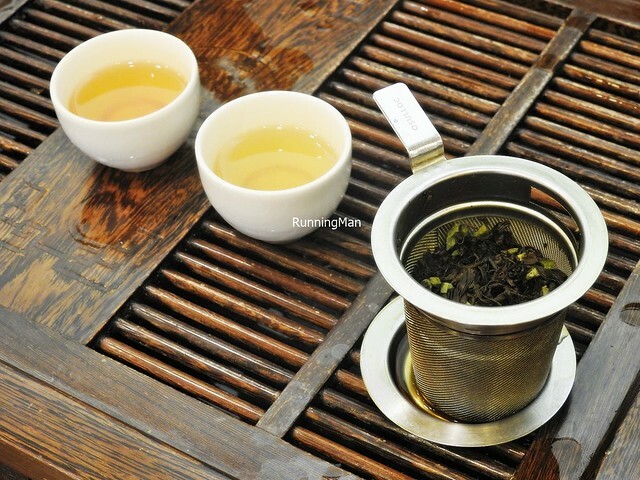 Has a rich, creamy smooth texture, with intense earthy vegetal sweet flavours of green tea. Among the best versions I've tasted. 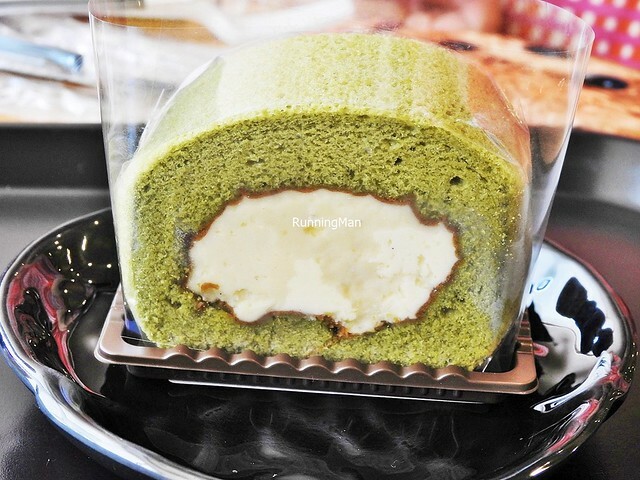 The Matcha / Green Tea Roll Cake has a fluffy soft green tea sponge cake, infused with premium green tea powder. The center filling is a rich, smooth cream of full cream milk and sugar, resulting in a light sweet flavour. Well balanced dessert confectionery, very nice. 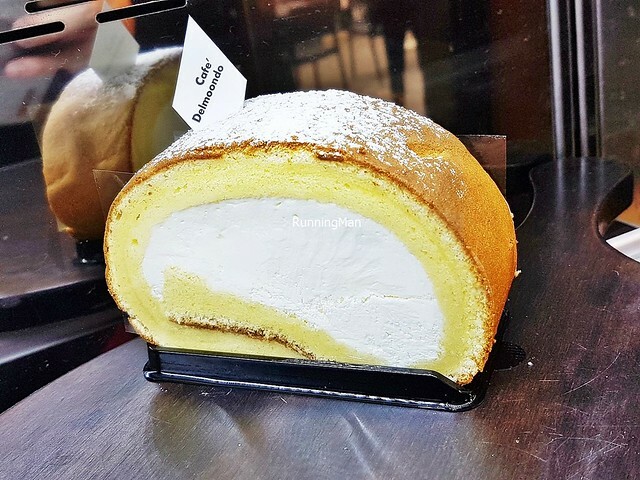 The Milk Roll Cake is a simple dessert confectionery, with a airy soft milk sponge cake, filled with a rich, smooth cream of full cream milk and sugar. Nicely sweet but not overwhelming, it's light on the palate. Tasty! 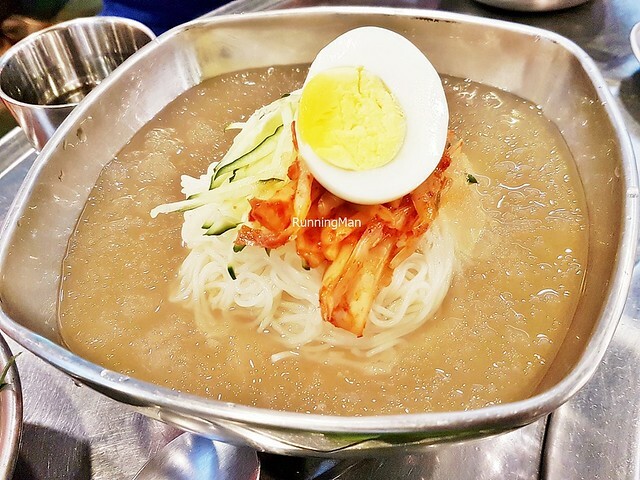 The Mul-Naengmyeon / Cold Noodles Soup is a common dish in Jeju & Seogwipo, owing to the strong noodle culture here. 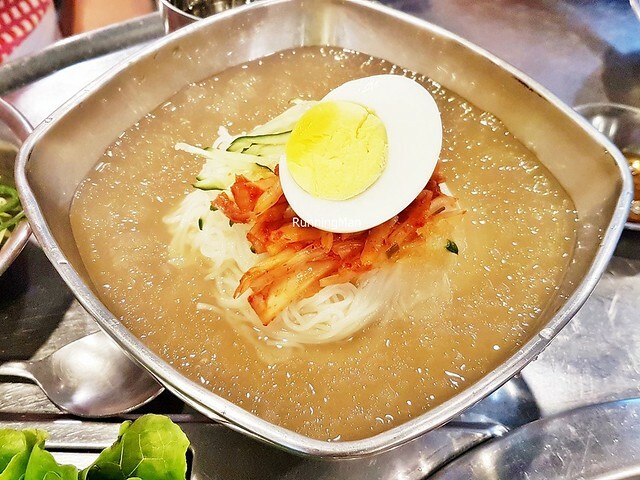 It features a rich, robust, chilled soup / broth of either pork bones or beef bones, consisting of long thin wheat noodles, cucumbers, boiled egg, sliced Korean pear, Kimchi Kkakdugi / Kimchi Cubed Pickled Daikon Radish, white vinegar, ginger, and garlic. It differs from the mainland version in 2 areas, the soup / broth, and the noodles. 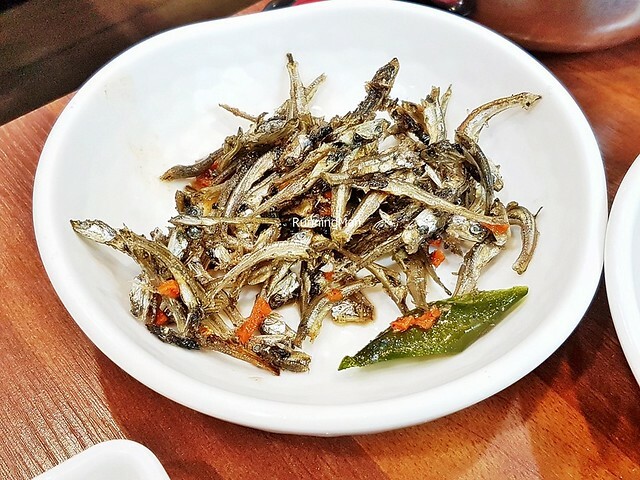 The Myeolchi Bokkeum / Fried Anchovies is a common side dish, made from dried anchovy fish, sugar, salt, garlic, gochujang / fermented red chili paste, and sesame oil. 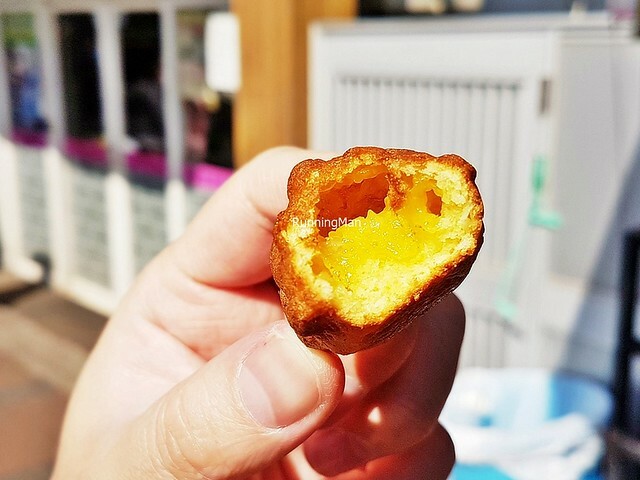 It has a satisfiying crispy crunchy texture, with flavours of savoury, salty, sweet, and is mildly spicy. 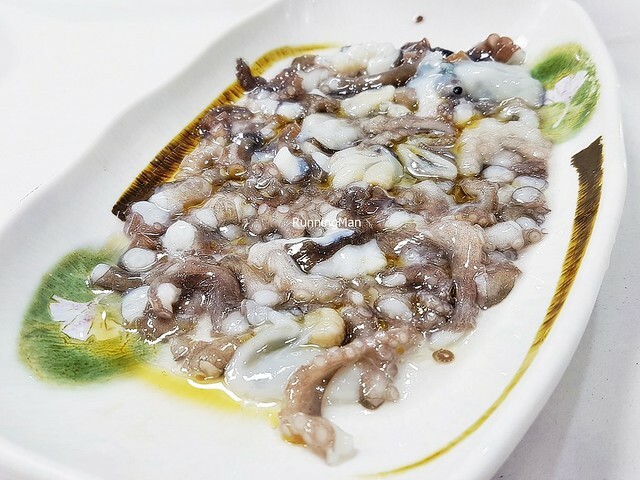 The Octopus Live has a live baby octopus, sliced up and served raw, marinated in lemon juice. Really fresh, the method of preparation causes the parts to wriggle around on the plate. 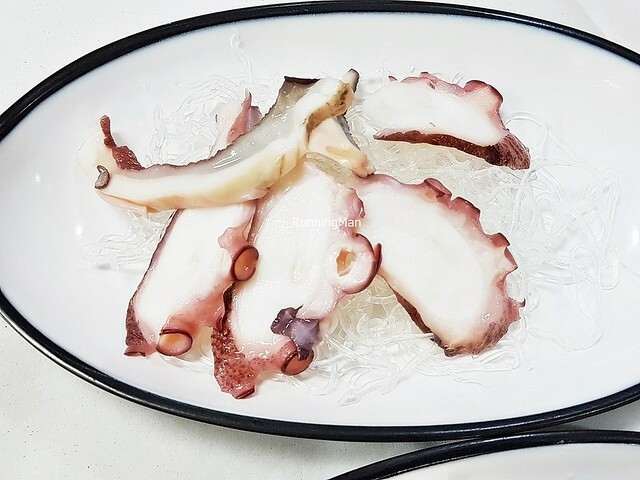 The texture is more bouncy firm than the regular cooked octopus, but it still has a delicate sweet savoury flavour, very clean-tasting. 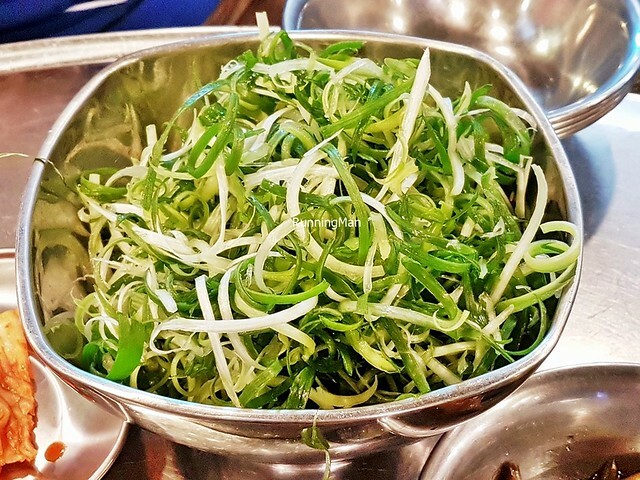 The Pa Muchim / Green Onion Salad is usually served as a side dish, to accompany barbecued meats. It features shredded green onions, simply dressed in sesame oil and gochujang / fermented red chili paste. More elaborate versions sometimes include sugar, light soy sauce, white vinegar, and sesame seeds. Nice crunchy texture with a bright vegetal sweet flavour. I prefer mine with more spicy gochujang / fermented red chili paste. 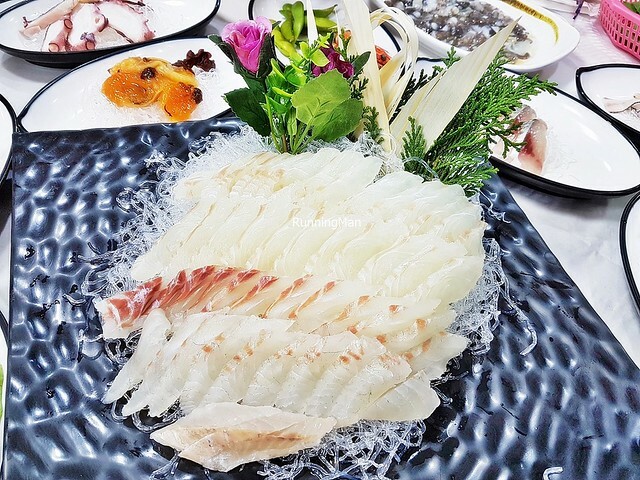 The Korean term Saengseon-Hoe refers to a variety platter of raw seafood dishes, similar to the Japanese sashimi, usually eaten in a group / communal fashion. Here, it's a local speciality, as the area is known for its fresh seafood. 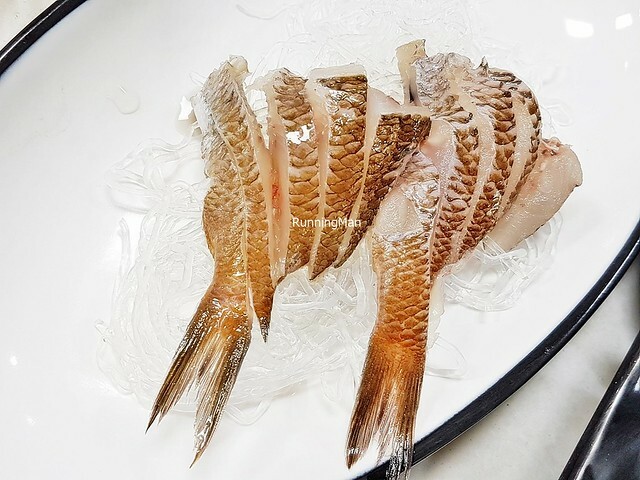 Catch combination usually differs from season to season, but normally includes several types of white fish, prawns / shrimp, squid or octopus, and shellfish. 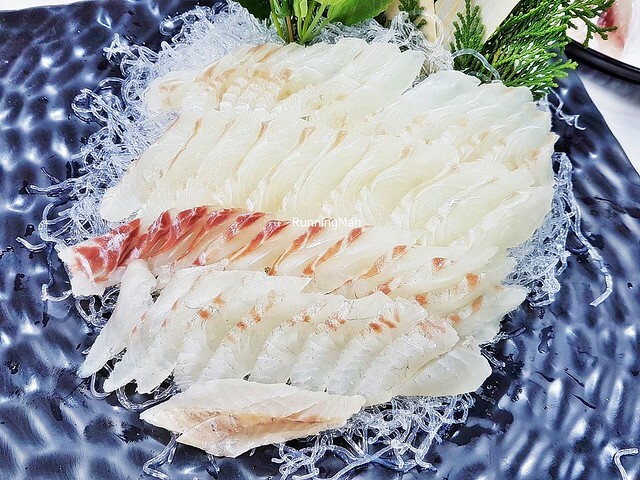 The Saengseon-Hoe - Cutlassfish / Largehead Hairtail here is outstanding. 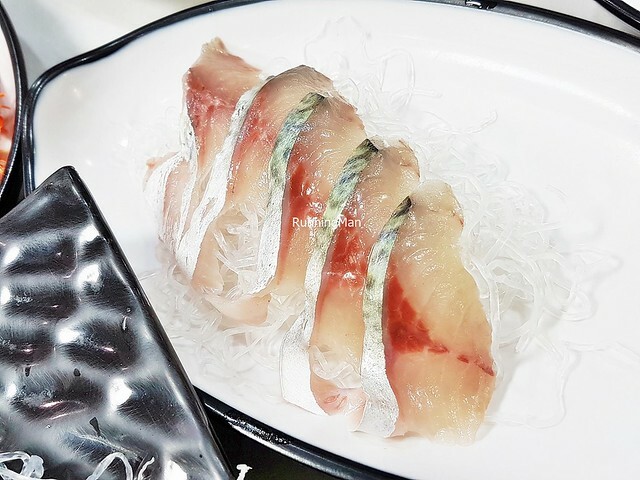 When served raw, the fish has a bouncy soft texture, and a beautiful silver shine to the skin. Delicate sweet savoury flavour, very clean-tasting and fresh. The Saengseon-Hoe - Sea Bream here is outstanding, possibly among the world's best. 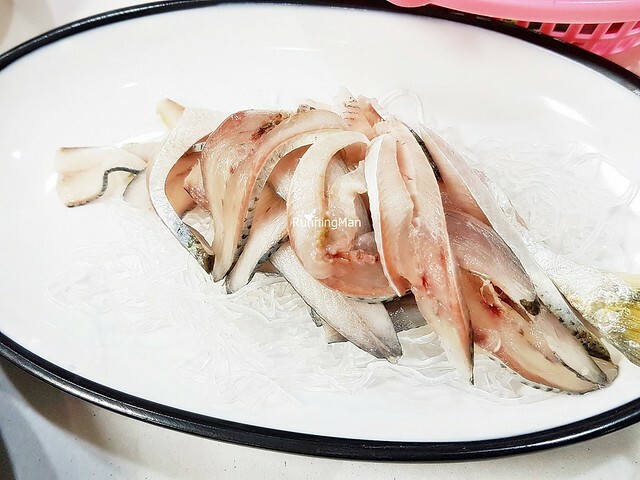 When served raw, the fish has a tender bouncy texture, with a nice chew. Delicate sweet flavour, very clean-tasting and fresh, completely enticing. 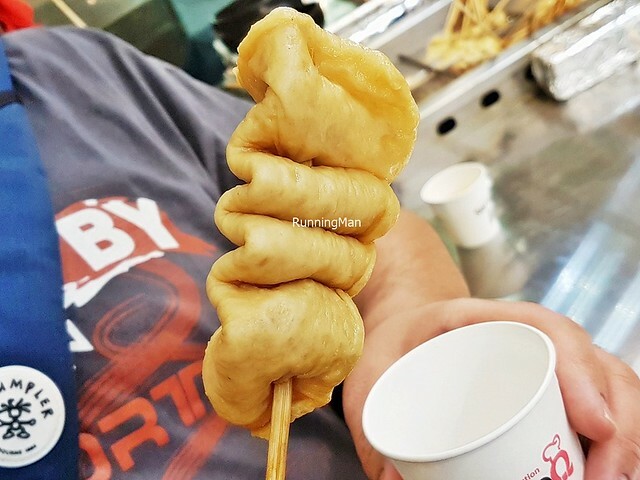 A unique dish with an other-worldly appearance, the Saengseon-Hoe - Sea Squirt consists of raw sea pineapple / sea squirt, eaten together with a mix of white vinegar and light soy sauce. 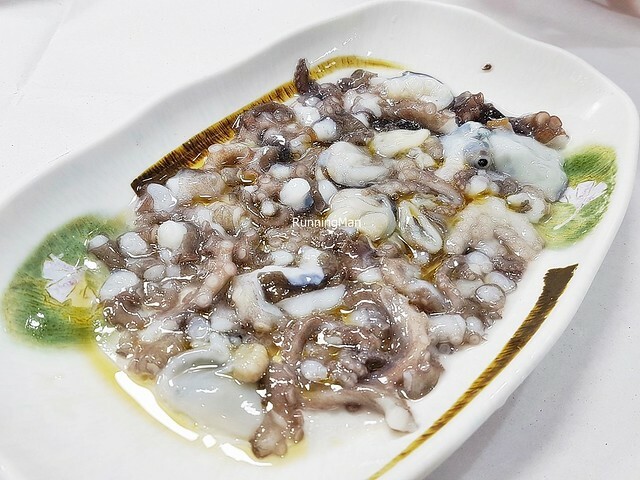 It has a firm bouncy texture, akin to rubber, with a peculiar taste, earthy briny salty chemical-like, similar to iodine. Among the more exotic dishes on the island. The Samdayeon Tangerine Tea is a blended tea, a mix of premium green tea leaves and tangerine, all grown in local farms. The blend is post-fermented in cedar wood, and has a bright, clean feeling, with a fruity earthy sweet flavour. 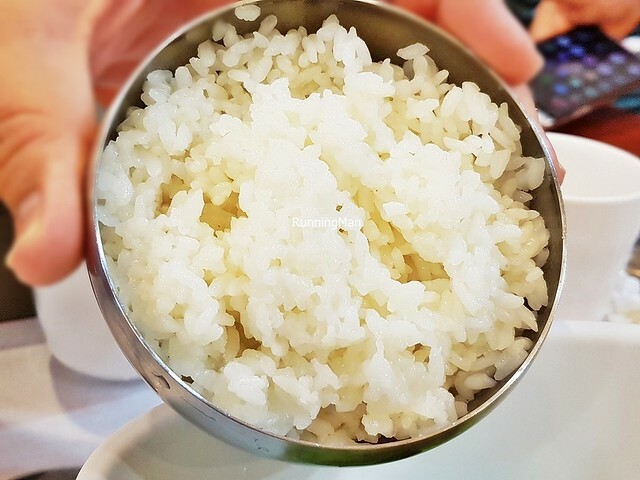 A bowl of Ssalbap / Steamed White Rice typically accompanies any meal in Jeju & Seogwipo, South Korea. The texture is sticky but not clumpy, with a light fragrant aroma. 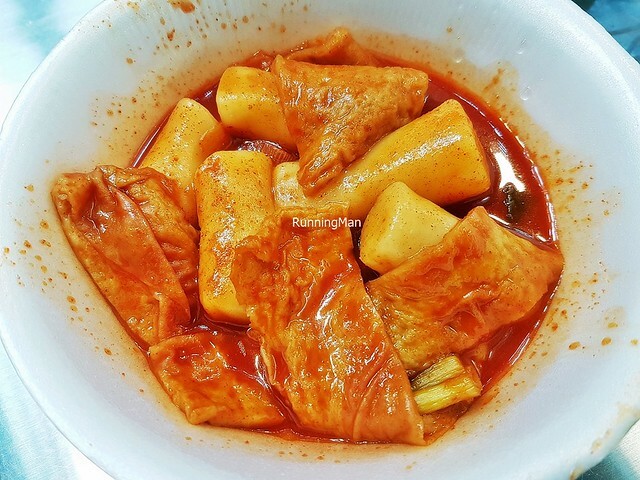 The Tteokbokki / Ddukbokki / Rice Cakes is a common and popular Banchan / side dish, also often sold along the streets as a snack. 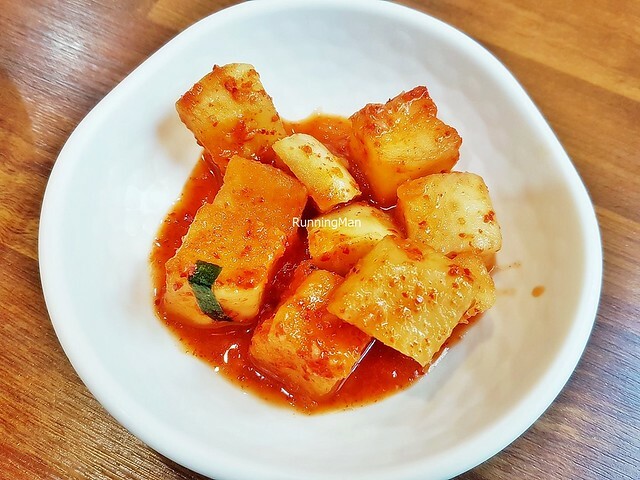 Made by boiling then stir-frying Tteok / Dduk / rice cakes, which are soft, chewy, but tasteless, glutinous rice cake shaped like round tubes, in a sweet, savoury, spicy gravy of water and gochujang / fermented red chili paste, along with fish cakes, onions, salt, sugar, garlic, and scallions. Sometimes, pork or eggs are added. 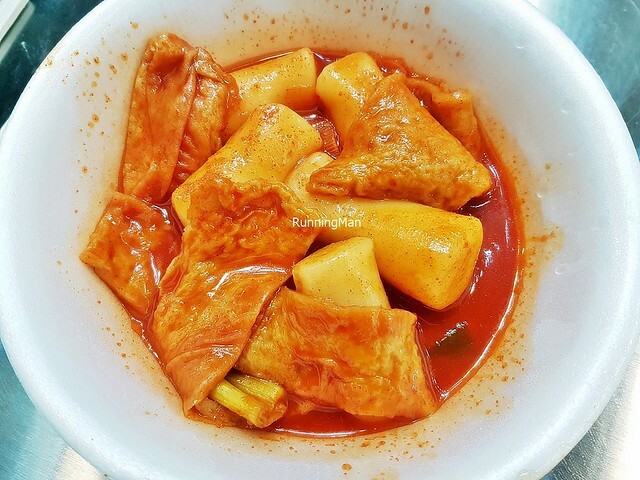 Tteokbokki / Ddukbokki / Rice Cakes is sometimes used as a base ingredient, and incorporated into other Korean main dishes. There are also many variations of it available. 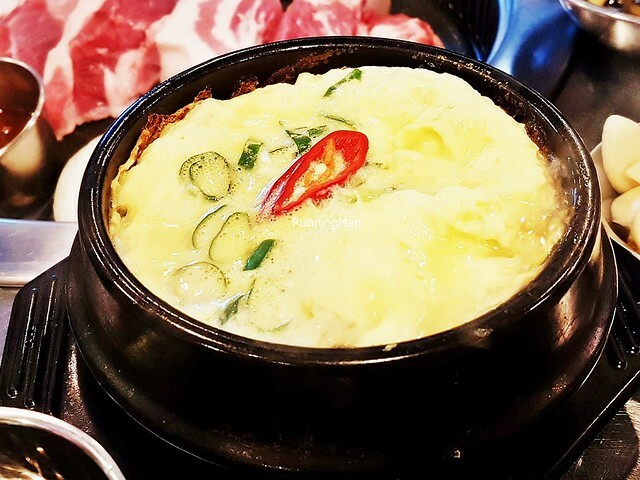 The Ttukbaegi Gyeran Jjim / Steamed Egg In Pot is a simple but comforting Banchan / side dish, consisting of eggs seasoned with garlic, aekjeot / fish sauce, chicken stock, sesame oil, then steamed till soft and fluffy in an earthenware pot, garnished with scallions. Love the nice, light, eggy sweetness, which pairs well with the more heavily seasoned main dishes. 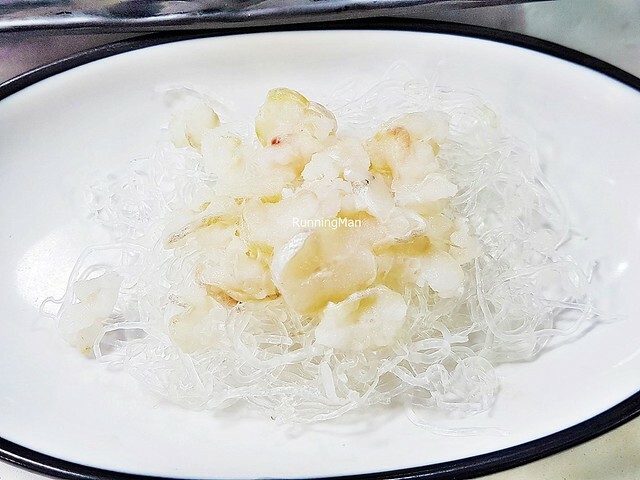 The Yangpa Jangajji / Pickled Onions is a side dish of white onions, pickled in white vinegar, salt, sugar, water, with chopped green or red chili. 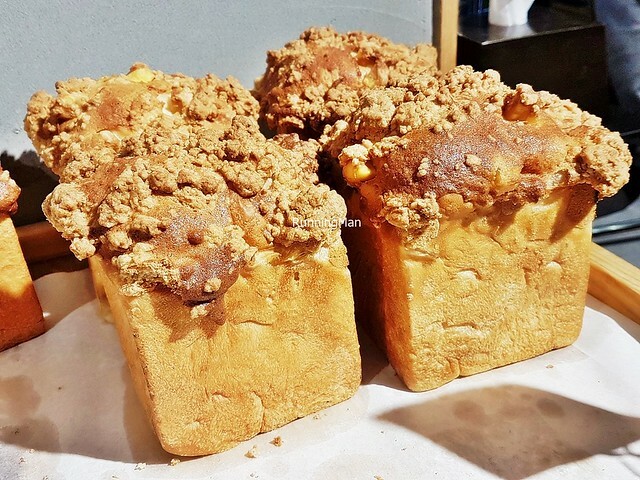 It has a crunchy texture with a sharp sour flavour. 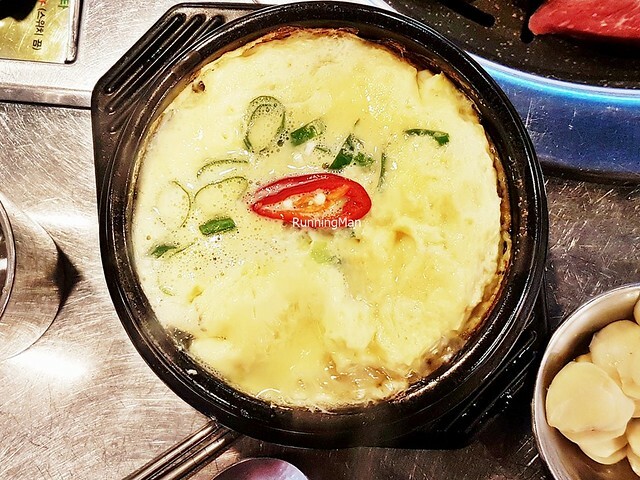 Usually paired with full flavoured dishes such as barbecued meats. 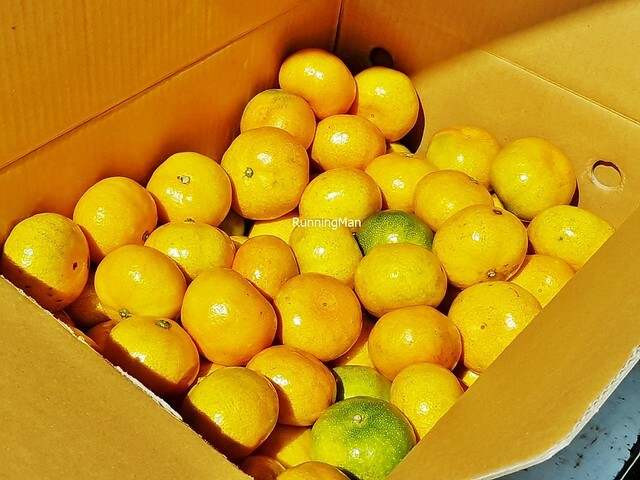 In Jeju & Seogwipo, in the Jeju Special Administrative Province of South Korea, Tangerine is a very common and popular fruit. Farmed tangerines are used as ingredients in several dishes, or eaten on its own. The local variety here is more sweet, and less sour, than other versions elsewhere, yet it feels delicate on the palate. 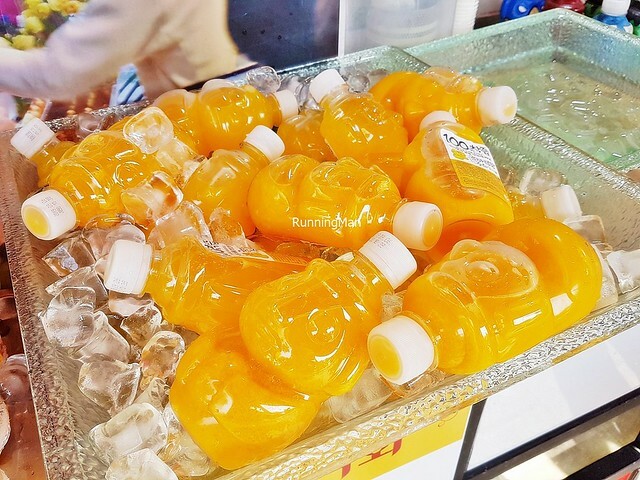 Fresh Tangerine Juice is a common beverage here. Profile of the drink is fruity sweet but not overwhelming, as it doesn't contain processed sugar. 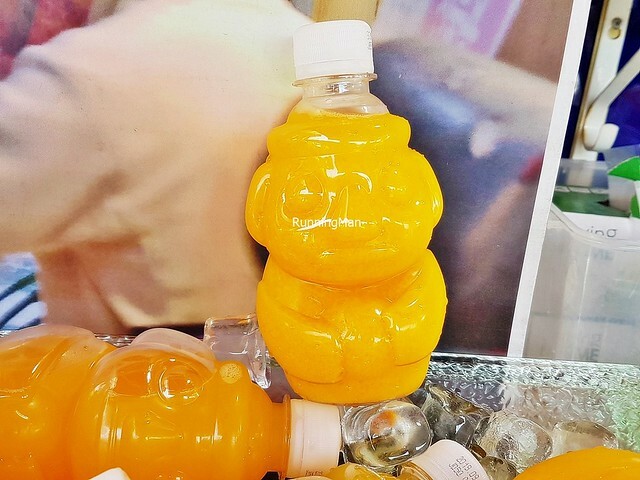 The natural versions have a light orange colour, and are usually bottled in small bottles shaped like the island's signature stone statues, the Dol Hareubang. 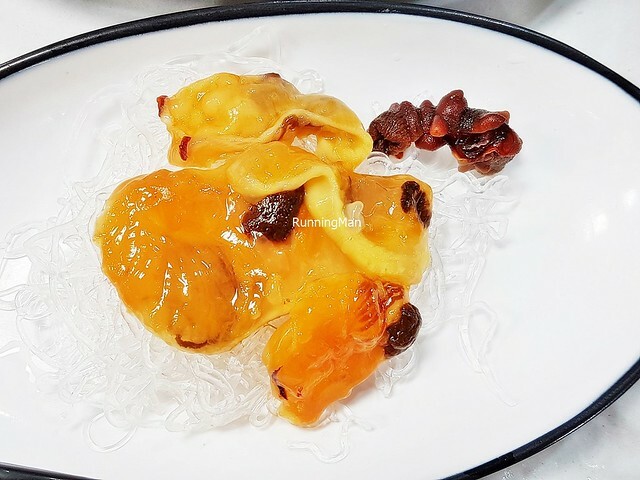 The Tangerine Golden Cake is a local dessert pastry, consisting of a soft fluffy tangerine infused sponge cake, filled with a rich thick tangerine syrup. 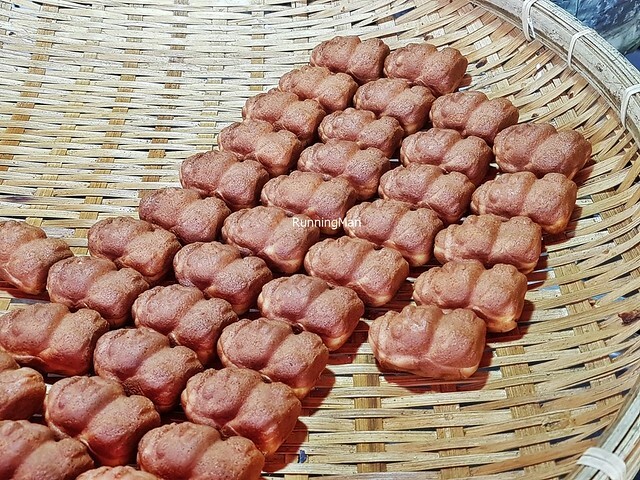 Bright and fruity sweet in flavour, the tiny pastry is shaped like the island's signature stone statues, the Dol Hareubang, and is sized to be eaten whole.